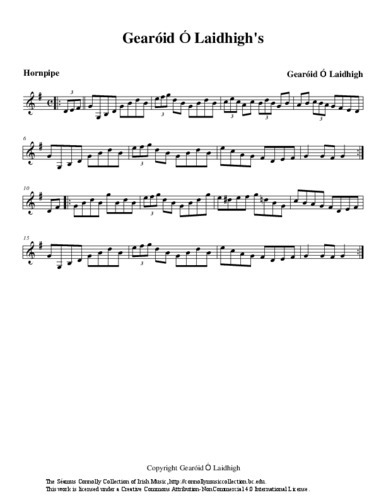 Fiddle player Gearóid Ó Laidhigh and flute player John Darcy recorded this tune, a composition of Mr. Ó Laidhigh's, for Ciarán Mac Mathúna. Ciarán traveled throughout Ireland recording musicians and singers, and later presented them on his weekly radio programmes, Ceolta Tire and A Job of Journeywork. On this recording, the tune is played on fiddle by my dear friend, colleague, and musical collaborator Laurel Martin. Martin, Laurel (fiddle) and Ó Laidhigh, Gearóid (composer), “Gearóid Ó Laidhigh's,” The Séamus Connolly Collection of Irish Music, accessed April 20, 2019, https://connollymusiccollection.bc.edu/document/420.